Venue: Clayton Liffey Valley Hotel, Dublin. In 2015, the HSE introduced the 'Diabetes Cycle of Care' (CoC) nationwide. The Diabetes Cycle of Care aims to provide care in the most appropriate clinical setting to individuals diagnosed with Type 2 diabetes. This education programme is aimed at nurses working in clinical practice who require basic knowledge and skills to care for people with diabetes on a day-today basis. The programme will assist participants in gaining an understanding of the clinical evidence underpinning the diagnosis and ongoing care and management of the person with diabetes utilising current best practice. Who should attend: Practice Nurses and similar healthcare professionals. This programme aims to update the nurse in the diagnosis and management of Type 2 diabetes. Ruth received her general training in the Adelaide Hospital, Dublin and in 1992 chose the career path of practice nursing one year following qualification. She is currently employed in a single-handed General Practice in rural Co Leitrim. She completed her Bachelor of Nursing Studies degree programme in the distance learning centre (Oscail) at DCU and followed this with a Masters in Nursing Science from the University of Manchester and the Royal College of Nursing in the UK. In 2001, she received Clinical Nurse Specialist status and in November 2005 was accredited as the first Advanced Nurse Practitioner in Primary Care in Ireland. Her role primarily focuses on long term conditions which include diabetes, hypertension, chronic kidney disease, coronary heart disease, COPD and asthma. In 2010, she completed the Certificate in Nurse/Midwife prescribing and became a Registered Nurse Prescriber. Ruth has published many articles on a wide range of clinical issues. She is currently consulting editor of Nursing in General Practice, the official journal of the Irish Practice Nurses Association. In 2015, she was appointed clinical director of NurseCPD which publishes e-learning modules for nurses. She is a trainer for Education for Health in the UK for the Asthma Diploma. She is also a tutor for the asthma and COPD on-line modules in NUIG. Ruth also runs her own consultancy business and has written and developed a number of respiratory education programmes which have been approved by the Nursing & Midwifery Board of Ireland and are delivered to practice nurses nationally. Ruth frequently supports the Asthma Society of Ireland, the Leitrim Branch of Diabetes Ireland and Special Olympics Ireland. In 2010 and 2014, she was the Medical Co-ordinator with the Irish Special Olympics European Team in Poland and Belgium respectively. In 2017, she was the medical co-ordinator for Irish Special Olympics World Team for the World Winter Games in Austria and has been recently appointed as the Medical Co-ordinator for Team Ireland for the World Summer Games in Abu Dhabi in 2019. In her spare time, Ruth enjoys walking, yoga, cycling, crocheting reading and gardening. Please ensure you have read the full course description or requirements before applying. Please also note this application is not a formal booking. We will be in touch shortly if your application is successful. You will be sent a confirmation email if successful and you will be required to complete a booking form and make payment prior to attending the course. Status: Jobseeker Employed / Employer in Private Healthcare sector. 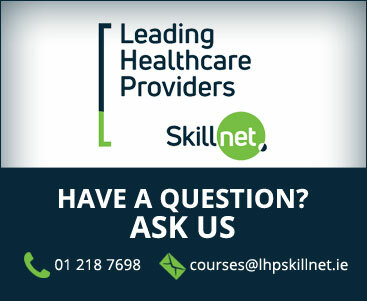 Please tick here to confirm that you are working in the private health care sector or that you are a job-seeker. Please ensure you have read the full course description or requirements before enquiring. At the bottom of this page are three options for you: Make Enquiry - Do you have a question about this course, let us know? Notify Me - Get notified by email when this course (or others) become available to apply online. Apply Now - Start your application process here online by completing a simple form. Exemption for previous modules completed?